More than 540 golf tour operators in 62 countries, all members of the International Association of Golf Tour Operators (IAGTO) voted Dublin East Coast as the European Golf Destination of the Year in the 2015 IAGTO Awards. The Award recognises the greatest achievements of golf destinations and golf resorts in terms of the experience they deliver to travelling golfers and the professionalism with which the destination and local industry work with golf tour operators. 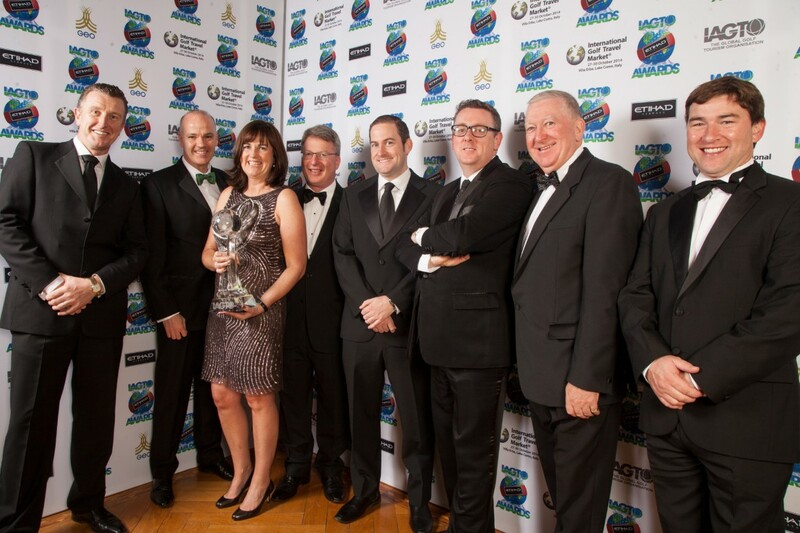 This prestigious award was presented to Dublin East Coast Golf Alliance Director Aine Mangan at the IAGTO Awards Gala Dinner in Lake Como Italy on Thursday 30th October 2014 on the final night of the International Golf Travel Market. “It is a great honour to accept this award and a wonderful recognition for the region from the world’s leading golf tour operators,“ said Mangan. “Dublin East Coast is home to some of the finest parkland and links courses and resorts all within easy access of Dublin International airport and the many attractions our capital city has to offer. Our aim is to consistently provide a great golf experience and warm welcome to our visitors to Ireland. Simon Gregory, Tourism Ireland’s Director of Markets, said: “Congratulations to Dublin East Coast Golf Alliance on being named European Golf Destination of the Year for 2015. This is a tremendous honour for the clubs working to promote this part of Ireland – and the superb golf on offer here. The fact that 540 golf tour operators in 62 countries voted for Dublin East Coast Golf Alliance is testament to the superb experience these clubs offer international golfers. Dublin East Coast Golf Alliance is a co-operative marketing group that was established in 2010 to promote Ireland’s Dublin East Coast region as a destination of choice for the golf tourist. By joining forces and working together, this has given a stronger impact internationally and helped explore more international markets. Members of this marketing group include Carton House, Druids Glen, Mount Juliet, Powerscourt, The Island Golf Club and The K Club. DECGA represents this region overseas at over 25 events on an annual basis and coordinates familiarisation trips for journalists, operators and Ambassadors to Ireland. This region has hosted many prestigious golf tournaments, including the esteemed Irish and European Opens, the Seve Trophy as well as the Ryder Cup in 2006. Dublin East Coast not only has great golf courses but also world-class hotels, restaurants, bars attractions and hospitality and, indeed, most recently its very own Ryder Cup captain, Paul McGinley.